When unexpected downtime hits, have a plan in place to capitalize on it. Anybody who has spent some time doing article marketing knows this mantra well: Write often. Write Well. But what happens when unexpected writing or submission downtime hits (e.g. your ISP connection dies, your computer crashes, article approval times tank, etc.)? Go to your Downtime Plan. This plan is a list of things you can always pick up and do at a moment’s notice. Items that could use a little polish to improve your results but don’t need to be done to keep moving forward. Review Your Strategy – Your article marketing strategy should leverage the use of articles to achieve your business objectives. Polish it until it does. Build Your Editorial Calendar – Jot down your next month of articles. This will motivate you to write on a daily basis to keep from falling behind schedule. Optimize Your Resource Box(es) – Your resource box(es) are where the rubber hits the road. Have printed versions on-hand and review during downtime. Look for ways to make your call to action irresistible. Research Future Articles – You’ve got your editorial calendar, now start fleshing out whatever content you’re missing. Develop Cross-Promotional Tools – EzineArticles has myriad tools for cross-promoting your articles. Spend a little time in the blog to discover which of these tools will work well for you. Review Article Effectiveness – Take a look at your articles. What works? What doesn’t? One thing you should always be ready to do is educate yourself on the art and science of article marketing. Have hard-copy and digital content always available. That way you can put downtime to good use wherever and whenever it happens. 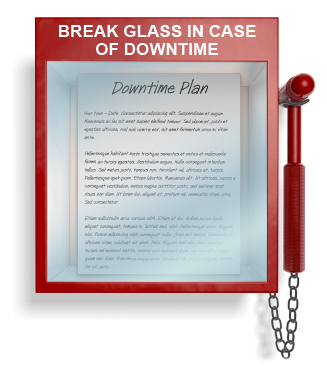 Bottom Line: Have a Downtime Plan in place and use it! Do you have other ways to utilize your downtime to improve your article marketing efforts? Tell us about them by leaving a comment! Thank you for sharing this post. It never comes to my mind to have my own Downtime Plan so that I can use the time more wisely. I’m excited about this advice. I’ve had something come up that’s put me on hold. Checking out each idea, will definitely help me speed up and pick up where I suddenly left off. Thanks for the strategy of planning ahead before a crisis happens that’s what I call positioning yourself to be proactive rather than constantly reacting to to life changes. Since, we all know that Life happens;-). Thanks! This was a very useful article. I appreciate the information that you shared on how to build an editorial calendar and stay motivated. I am definitely going to review the cross promotional tools! thank you for this article! one never expects things to fall apart, but they do. this really makes one aware that there should be a plan. thank you for the great advise. Interestingly enough, I have a “down time” list of things to do. Mine consists of going through my stack of newspaper clippings, and trade journals. And reading them for article ideas. I do this for the same reason that many women keep a paperback book in their purse or why guys leave a book in their car. There is this saying; “A gentleman is never bored” and I’d often wondered about, and even written about “What if?” scenarios, as in what if the entire Internet crashed or the power went out for 2-weeks or longer. In times of natural disaster this is more than possible. In CA we have Earthquakes, wildfires, and other such problems, but no location is completely free from some type of weather related event, flood, ice storms, lightning, or Hurricane, Earthquake, or whatever, maybe some bizarre thing happens and a router goes out or your ISP goes caput? Everyone should consider this. Sometimes interruptions create a CRISIS, but every Chinese person knows that the symbol for crisis in their written language is a duopoly, it comes from two symbols; Danger and Opportunity. I enjoyed this philosophical quote, because it makes us all think. Today, young people go bizerk if they cannot log on to myspace or send a text-message or Twitter, seriously they go crazy, and even most adults get very out of character if they cannot check their emails. RELAX PEOPLE! Use that time for something positive, you just have to have a plan, like this post states, and be able to rapidly switch gears. That’s what I do, and you know what, it works because success often goes to the most agile. And who knows what opportunities you will find in times of crisis. I always find opportunity in chaos, so should you. that’s all for now, good posting here. Motivation for me comes from knowing WHY I want to do what I do. Hope that helps… It’s very difficult to motivate yourself to do anything unless you know WHY you want to do it. ie: What’s your end outcome? My end outcome is staying on top of Google and other major search engines, as I build my business. And speaking of down time, we are about to head out to the mountains for the weekend, and are NOT taking the lap tops….God Help Me…. I love writing and graphic design and have a strong passion for both. The image created in this post is the work of a genius. Just thought I would say that during my downtime. Thanks for the ideas, never really thought much about the cross promotional tools until now. Thanks again I’m off to check out the cross promotional tools. Thanks a lot for this useful and innovative information. I will follow these in my next articles in EzineArticles. This will definitely help the writers a lot.